There hadn't been any Google Maps app for iOS after Apple decided to introduce their own mapping service within iOS 6. And while Cook and co infamously failed and had to cope with huge problems and bad critics, Google kept denying any work on a new Maps app but advised to their mobile website as a suitable replacement instead. For some time it seemed completely unclear in what way Google would treat the platform from then on. But suddenly - three months after the release of iOS 6 - a completely new Google Maps application was released to Apple's App Store. This new Maps app did not only bring the old stock app back, but was a whole new program featuring many new features and a completely redesigned user interface, for which it was praised by critics. And with this new app Google also made a clear statement on how they would treat iOS from then on: Being frequently called a 'first-class' operating system, all of Google's iOS applications saw major updates and great redesigns. 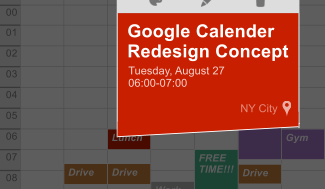 Google+, Drive, and many more were completely reworked. Google Keep and Hangouts got a great iOS version right from the beginning. And even Google Now - which was seen as the �killer feature� of Android - has been built into the Google Search app. There's really no doubt that Google is taking iOS seriously. Some features even arrived earlier on iOS than on Android. The latest apps to join this list were Google Play Music and Play Movies & TV. You can�t actually purchase any content directly in these apps, as Apple wants to get paid then, but except from this they're definitely also such gorgeous Google apps. Why shouldn�t Android become a �first-class� system for Apple, too? The main reason for the adaption was probably Google�s new music streaming service Google Play Music All-Access. Nevertheless, I personally began purchasing songs from Google Play now, because all my songs are now synced across my Windows PCs, my Android Smartphones and Tablets, as well as on my old iPod Touch. And because of this I noted at the end of my article about a possible web adaption of Google Play Newsstand that �being extremely limited and short-sighted, Apple cannot even offer me half of what Google already does�. But why not? 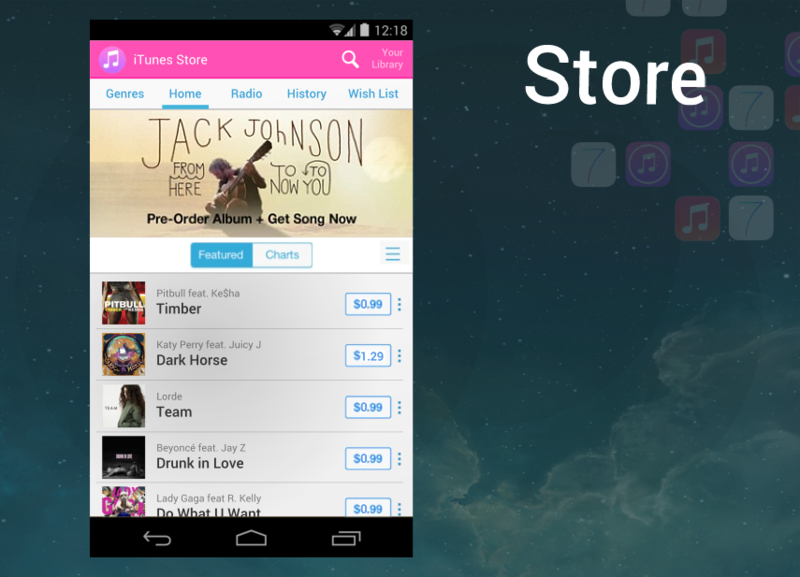 Why shouldn't Apple release a version of iTunes for Android? Even though sort of everything points against such an adaption - I�m going to point this out in just a minute -, I made some mockups imagining what such an iTunes app for Android could look like. Google Play Music sort if ignores most of Apples app design guidelines, but instead features most of the navigation and interface fragments usually found on Android (i.g. a lot of action overflow buttons, the action bar and the slide-widget). As their apps do still run very fast and fluid, I don�t think it's a problem. 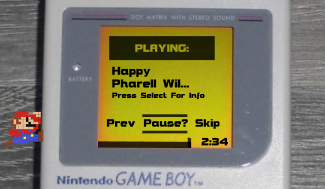 I actually really love the interface and especially the idea. It may not have a great influence to users in a way that they�re getting used to Android due to this. But they're sort of a business cards or a flagships, showcasing Android's UI. So I do also really enjoy the idea of an Android version of iTunes. It should of course also feature UI elements of iOS7 - just like Play Music does. 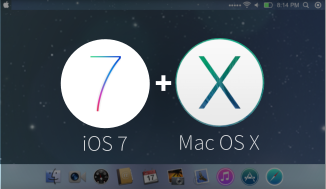 In just the same way, Apple should also promote iOS7s design. The concept pictures show what this might look like. Apple definitely has the power to make such an app look and feel great and not strange like for example BBM. The focus is laid on (colorful) typography and blurred backgrounds. Just like Google's Play Music app, it should also combine lots of Android features. There are also overflow buttons, an action bar and the typical android �up� and back navigation. Apple should even be able to offer the user more on Android than Google does on iOS, thanks to the openness of Android. 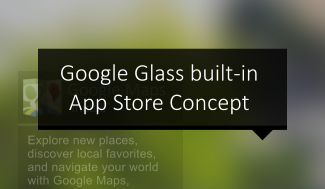 A store, for instance, could be made without having to pay anything to Google. But this openness of Android also contains problems for Apple. If they were really going to take Android completely seriously - just like Google does with iOS - Apple would also have to include widgets with their app. 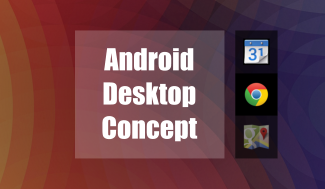 And they'd have to take full advantage of Android�s extensive notification system. And of the unique way applications can share data. And these are only three aspects out of a whole list of things that iOS is lacking or struggling with. 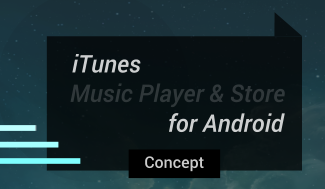 Apple would either have to make it�s iTunes app for Android inferior to the Google Play Music app - and by this non-essential - or to offer the user more on Android than on iOS. But on the other hand side, an Android version of iTunes would probably still multiply the number of possible customers by many dozens. And as there's also a Windows version of iTunes, why shouldn't there be an Android adaption too, especially after Android is the most used mobile OS? Well - I'd first like to point out that Apple still isn't merely a software company. The amount of money they make by selling songs/movies/apps/etc might still be growing rapidly. But their main plan is to get people use their devices and only then make them use their software and buy content. The fact that there's a Windows version of iTunes at all is simply due to the dominating circumstances from when the first iPod came out. There hadn't been a store directly on the iPod like there is on iOS today. So if Apple would've restricted the iPod to the Mac, only an insanely tiny percentage of people would've been able to use it. Even today Macs only play an important role for designers and journalists. And Microsoft may be about to make Windows a portable system today, but it wasn't one back then, thus Windows was also no direct competitor of at least the iPod back then. Not at least we also shouldn't forget that a lot of people only get their music from iTunes because they're used to it. They might even use an Android phone today and don't even own any Apple devices anymore at all. But it's simply iTunes! And it's not just the fact that people are lazy or something like that. Migration seems to be a major advantage for Apple. So while there might be a growing number of people exploring the possibilities beyond iTunes, there is probably an even greater number of people who mainly even only still use an iPhone today because of migration problems. Apple would make it easier to switch to Android! And that is probably the least likely thing to ever happen. So - the only really good reason for Apple to make an Android adaption of iTunes would be the advantage in the currently booming fight of music streaming services. Not to forget the prestige factor of such an app. So would it be worth all this? Certainly not. Apple - unlike Google - can only lose against Google's stock music player. And they might lose an important reason for people to go with iOS. Not at least Apple is still Apple. It's the same company that still denies to use micro USB on their mobile devices and it's the same company starting tons of lawsuits. Doing something like this would be completely against and different from their past behavior. But anyhow, it's just really nice to think of such an implementation. Looking at the concept pictures you can really imagine what using this application might feel. Talking about prestige - What might be a much better idea for Apple would be to make small UI elements of iOS 7 available on Android. In contrast to iOS, Android can be heavily personalized. So Apple could make use of this core feature and release an application bringing for example the beautiful iOS 7 keyboard to Android. Doing so, users might see 'a small snippet out of iOS 7's greatness', but not too much to make the original non-essential. 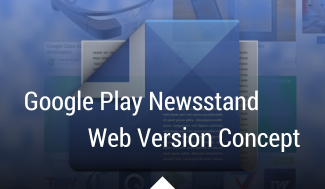 What about a web version of the new Google Play Newsstand?